This is a fresh and filling dish that is ready in minutes. It is perfect for those days you want cooked food but you don't want to be cooking for a long time....which is every day for me!!! Add all of the ingredients into a jug and mix well, allow to rest while you prep the other ingredients. Heat a large frying pan on a high heat, add the oil, mustard seeds, curry leaves and 1 tablespoon coconut. Fry for a few minutes until the seeds start to pop. 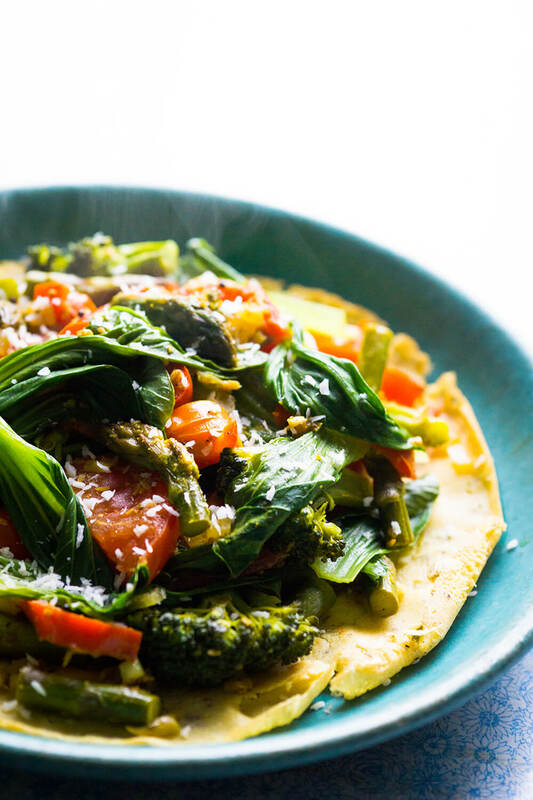 Add the asparagus, broccoli, pepper and tomatoes, add a splash of water, cook for few minutes then add the pak choi. Cook for a few more minutes until the veg is just cooked. Remove from the pan and cover. Heat a little oil in the pan then add the pancake batter tipping the pan to the side so the batter spreads out. Cook for a few minutes then flip over, add the veg to the pancake, once the underside is cooked put it onto your plate. Top with the remaining coconut and a generous squeeze of lime.